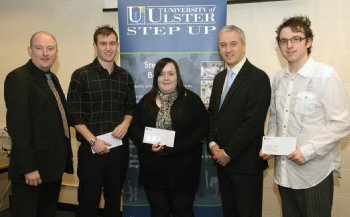 Three University of Ulster Step-Up students have each been awarded scholarships worth £1,000 sponsored by vehicle leasing company, CVC Direct. David Ball, Tristan Dickey and Kara Chapman beat off stiff competition to scoop the three awards which will help support their academic studies. First year students who graduated from the University’s innovative Step-Up programme in August were invited to apply for the scholarships, highlighting how the funding would enhance their education.